This verification process is scheduled from 08-08-2018 in all the erstwhile districts and it will be completed depending on the No. of candidates who have been selected in 1:3 ratio. DEOs of the earstwhile districts will conduct the whole verification process during the mentioned dates. The venue for the verification will be decided by the earstwhile DEOs. Candidates have to consult O/o DEO for the venue of Certificate verification. In view of the verification process candidates must follow some guidelines while attending to the verification. verification officer will check all the certificates of the candidate in sequential order as per the guidelines issued by the TSPSC. Here we are giving the same order of sequence(as same as given by TSPSC) to the candidates for attending the verification. 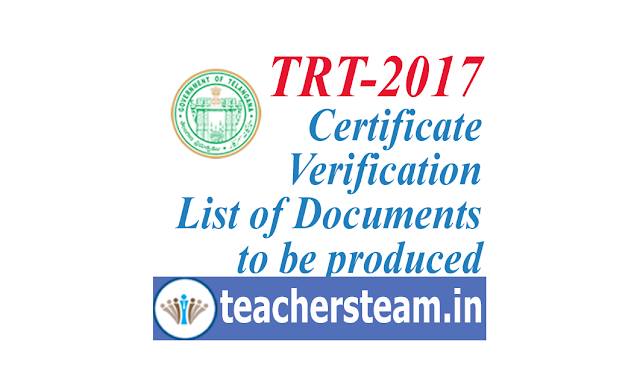 Candidates must bring all originals original certificates along with them for verification. Know the step by step verification process which will be done during the verification. Download Here.